Hey everyone, and happy Friday the 13th! First up, good news for all you Pinterest users! I haven’t used Pinterest much in the past, but yesterday I found to my amazement that a couple of you lovely ladies had pinned some of my nail designs. So, to make it easier, I’ve added a ‘Pin it’ button at the bottom of each post along with an option to follow me on Pinterest in the sidebar on my home page. Enjoy it and thanks for the love! Today’s theme was animal print. 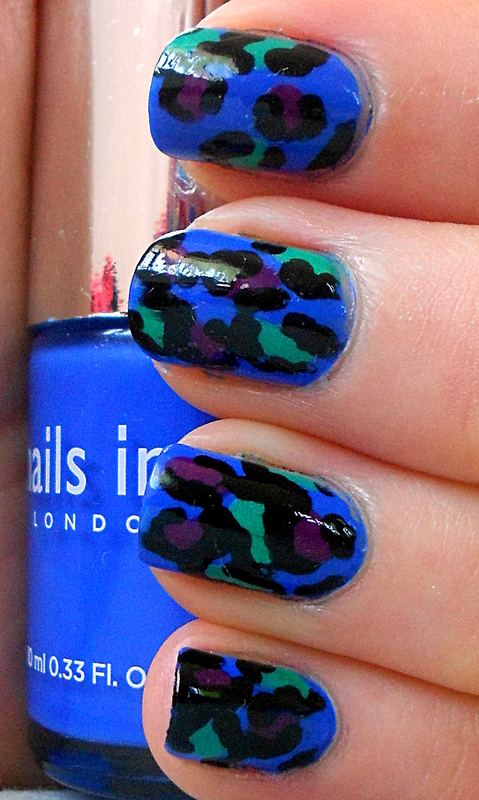 I’ve never been a big fan of leopard print on clothing, but in small doses, like say… just on your nails, I can get behind it. Especially when it has the redeeming factor of funky colours! 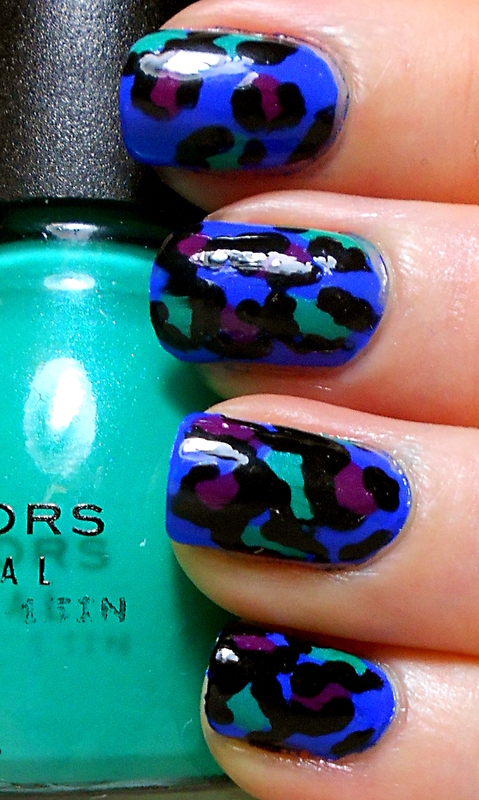 So, this was my first ever try at leopard print nails. 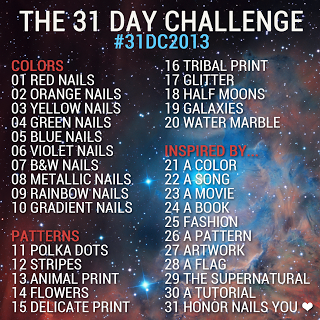 I started off with one of the most beautiful polishes ever, Baker Street by Nails Inc. It is just such a beautiful, bright and rich blue. I then used a big dotting tool to apply uneven splodges of Sally Hansen Complete Salon Manicure in Cherry, Cherry, Bang, Bang! and Sinful Colors in Rise and Shine, followed by creating partial outlines with a smaller dotting tool in Sally Hansen Hard as Nails Xtreme Wear in Black Out. It seems as though my print started out neater on my thumb and index finger, then got progressively larger and messier as I went along! Oh well, leopard print isn’t supposed to be ‘neat’ as such. 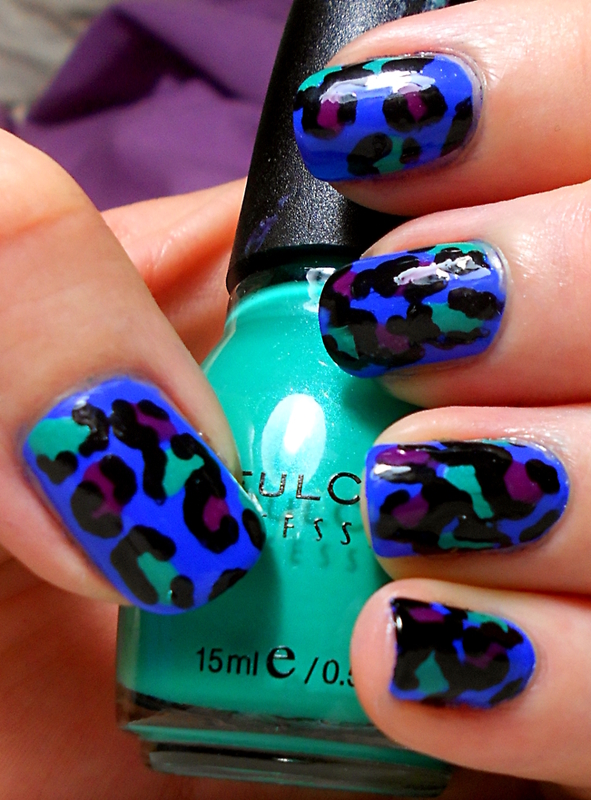 Do you prefer a more traditional leopard print or do you also like funky coloured ones? Tomorrow’s theme is flowers and I will be showing off my first ever try at using acrylic paint for my nails, be sure to come take a look! i love ANY animal print so i obviously love this!!! I am a huge leopard print lover. I love this!!! I love the colours you put together!! Thanks! 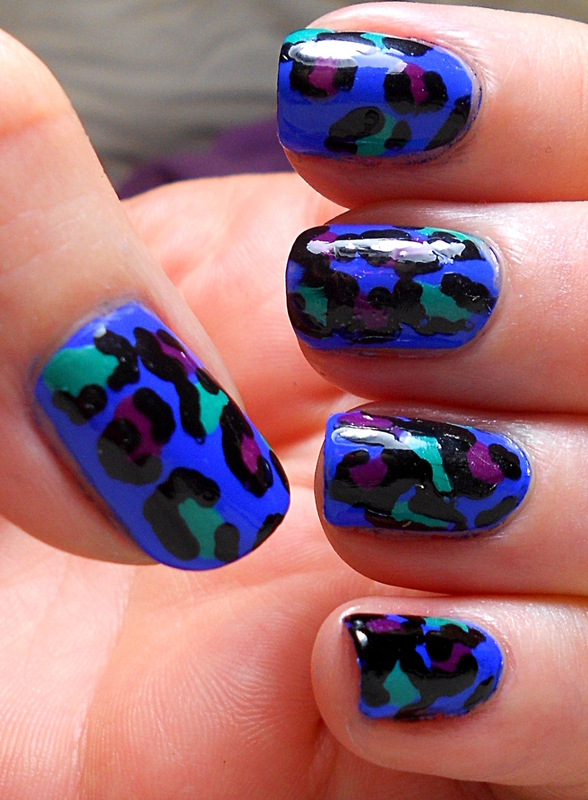 I am still warming to leopard print but if I can use such great colours, anything works!